It's been two months since Ferrari recalled all its 458 Italia models due to potential fire issues. 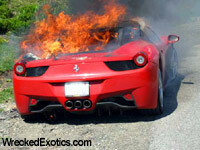 Up until then, we had seen the 458 Italia go up in flames on a regular basis. 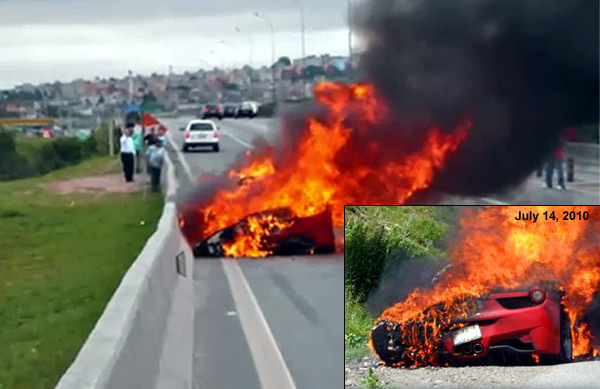 We thought the problem had been fixed since there were no incidents since the recall, but new questions have now arisen after a Ferrari 458 Italia burst into flames in Sao Paulo, Brazil - the first fire since the recall. 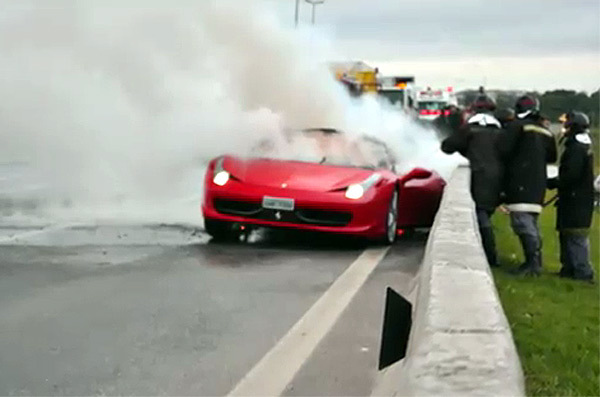 We don't have much information about the incident other than the Ferrari caught fire while travelling on the highway. 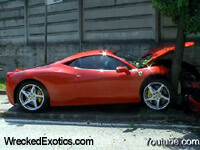 It's possible this Ferrari did not have the recall work completed - we don't have that information yet. This latest fire closely resembles one from July 14th in Switzerland. As you can see, it looks like the fire originated in the same place and resulted in the same damage patterns. 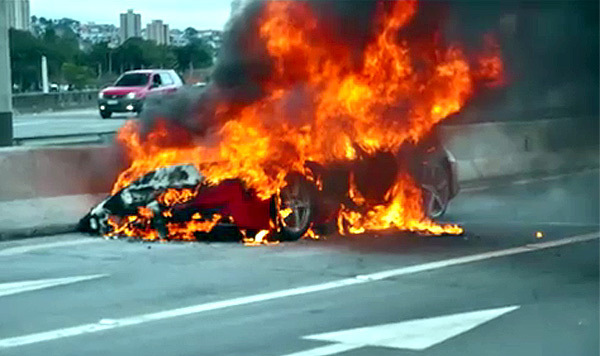 If it turns out this car had already gone through the recall repair, Ferrari will have some tough questions to answer. The first crash occurred in Wroclaw, Poland. According to an eyewitness, the Ferrari was driving between 60-70 mph when it approached an intersection where a small bus abruptly made a left turn in front of it. 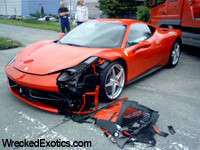 In an effort to avoid crashing into the bus, the driver of the Ferrari veered slightly to his left and crashed into a Volkswagon Bora. Spotted on the back of a tow truck in Sitges, Spain heading towards Barcelona. It appears the Ferrari sustained a fairly high speed impact - but we're not sure if it happened on a track or on public roads. This crash occurred on a wet race track in the Czech Republic. No other details are known about this incident. 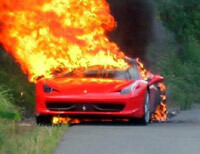 The was the first time the 458 Italia caught fire. In this incident, the driver noticed the rear panel on fire while driving in Paris, France. A passerby used a fire extinguisher to stop the flames before it engulfed the vehicle. 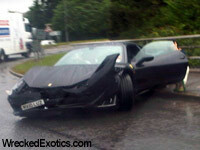 This 458 Italia was being transported from Saudi Arabia to London. While it was stored at London's Heathrow Airport, a fire broke out and completely destroyed the car. Driving up a mountain pass in Switzerland when the engine caught fire. 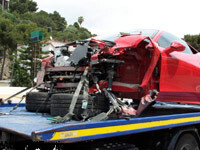 Owner had the car for only one day when he crashed into a tree outside the Ferrari factory in Maranello, Italy. Witness saw the driver playing with Magneto switch trying to show off to female passenger. Entered round about and planted it, the back came around before he had a chance to reacte and he hit the barrier. Occurred in Marlow, United Kingdom. Had less than 200 miles on the odometer. Owner had the car for 6 hours when he ran it into a ditch while trying to overtake another vehicle. Pardubice, Czech Republic. The first wreck in the United States. Caught fire in Costa Mesa, California. The first wreck in China (city of Ningbo). Caught fire after only about 1,000 miles on the odometer. The first incident after the recall. 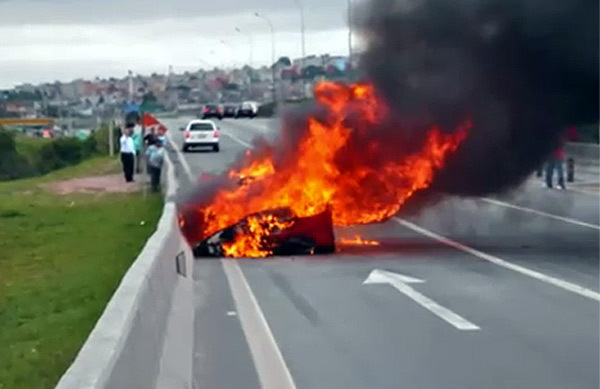 Car burst into flames on the highway in Sao Paulo, Brazil.